At Dive Bequia we've been diving the reefs surrounding this beautiful island for over 35 years. We're an owner operator store under the same management since 1984. Come and explore the diving delights of the blue Caribbean sea with our professional, experienced and safe team. Bequia is surrounded by a fringing coral reef teeming with diverse aquatic life, complimented by four wrecks, lots of swim-throughs (and an ATM machine!). 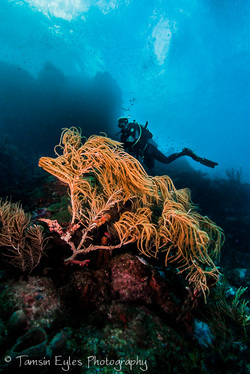 There are 24 dive sites to explore. Our location at the Gingerbread is convenient for yachting divers and centrally located for land based travelers. You can tie up your dinghy at our dive dock or we'll collect you from your yacht or the beaches in Admiralty Bay. We're open from 0800 until 1630 Monday through Sunday. We operate two very spacious 30' custom-built dive boats, shaded by full awnings to keep you out of the sun and drop-in water ladders for easy exits. Let us do the hardwork for you; we provide a valet diving service with your equipment ready for you each day and returned to the dive centre to be rinsed and stored for the following day. It couldn't be easier to go diving! Our excellent team of instructors and divemasters are fully insured and licensed to teach our advertised courses. We use the latest PADI materials ensuring you receive up-to-date instruction. Between our international and local staff we have dived all over the world including Canada, the Red Sea, Papua New Guinea, the Bahamas and throughout the Caribbean. Our unparalled experience ensures a great diving experience whether you are an experienced diver or just beginning your diving adventure.